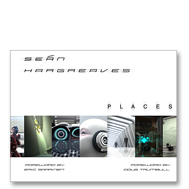 Sean Hargreaves believes that for artists and designers, images are born from the experiences one observes during the first 10-15 years of their lives. Those images are subconsciously refined over and over in one’s life. They may consist of shapes, or places, or films…but they always stay present in the back of the memory and now and then they make an appearance in an image or design that is created. Two important images that stand out for Hargreaves from his youth are the modern house in the green countryside of Northern England that his father built and furnished with prominent mid-century pieces and the machines that he saw when he accompanied his father on business visits to factories; both are extremely prevalent in the artwork throughout these captivating pages. Hargreaves states that designers are taught that sketching is an important part of the design process. The final image is the presentation of the refinement of all the sketches. When the final image is presented, it is usually presented with all the sketches that led up to the final design. Though Hargreaves agrees with this approach to a certain degree, he also questions it, feeling that there are “filtering” issues when sketching; the sketches that follow the initial idea may be refining it but it also “waters down” the initial design. As a result, the final design may end up being a mere long lost relative of the initial idea. The designs in this book started out as an exercise Hargreaves laid out for himself to counter what he learned, he wanted to create designs without any preconceived sketches, he wanted to design as he was designing. The results of his exercise are contained within the pages of this amazing book. Covering every aspect from the vase in the corner of a room, to the cityscape that contains the building that contains the room with the vase that holds the flower, Hargreaves has created places beyond our imaginations yet firmly rooted them in reality. Unbelievable to most, no photographs were used when making these stunning places, space was designed digitally and directly. Categories: Books, we made too much on the reprint. Tag: sean hargreaves. The collectible cloth bound edition of PLACES in a cloth slipcase. Only 100 available worldwide!